"Don't make out I'm in the wrong"
After three superlative, and interlinked, series, one might have forgiven Jed Mercurio for leaving Line of Duty as it was. But the show has been a victim of its own slow-burning success and so a fourth series has arrived, with a plum Sunday evening slot in the schedule to boot and the good folk of AC-12 are once again with us. 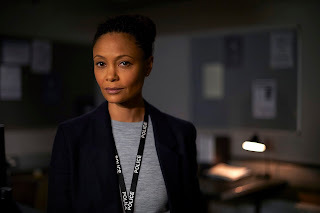 And having most cleverly toyed with its structure of featuring a high profile lead guest star in the previous series, the arrival of Thandie Newton as this year's bent cop (or is she...) left us pondering how the hell are they going to top Series 3's opening instalment. Well, like this is how! The beauty of Line of Duty has been how it has increasingly embraced its batshit mental moments with the intense realism that comes from its peerless interrogation scenes. It is both silly and serious and it pulls it off with real élan - so much so that you don't care how ridiculous it is that Vicky McClure's Kate can still slide in to work undercover in police stations that are down the road from her own or that forensics guys apparently aren't so hot at telling whether people are dead or not. The main narrative of Newton's DCI Roz Huntley, under investigation for potentially framing someone for a long-running serial murder case cos her boss told her to do it (maybe), looks fascinating (it helps that Paul Higgins is that boss). I like that they've employed the fine Dutch actress Gaite Jansen, I like that they've brought back Maya Sondhi's excellent PC Maneet and with Jason Watkins in tow, the final 10 minutes were just fantastically over-the-top as Mercurio successfully accomplished the feat of outdoing THAT twist. I can't wait to see where we go from here.